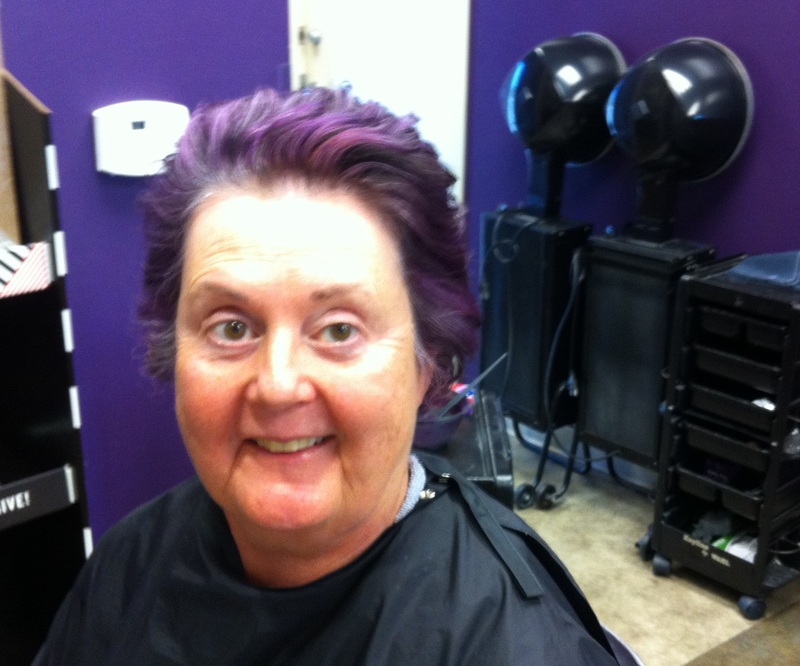 Last week I streaked my hair purple on a whim while getting my hair cut at the Supercuts in Kona Commons. On this day, Cody set me down in his chair. He’s a stylish hip young man with the coolest hair: crew cut at the base, topped by longish hair that tapered down to a point at the back. This longer section was brown at the roots and blonde on top. I complimented him and said, “I wish I could pull that off.” I was referring to the shape of my face, which is somewhat square. But he thought I didn’t have the nerve. “It’s all based on attitude. If you have the right attitude, you can wear it,” he explained. “Oh I have the attitude,” I replied. “But if I was going for something different, it would be streaking my hair purple.” My daughters have been egging me on about purple hair for a couple of years now and I’ve been sorely tempted a number of times. 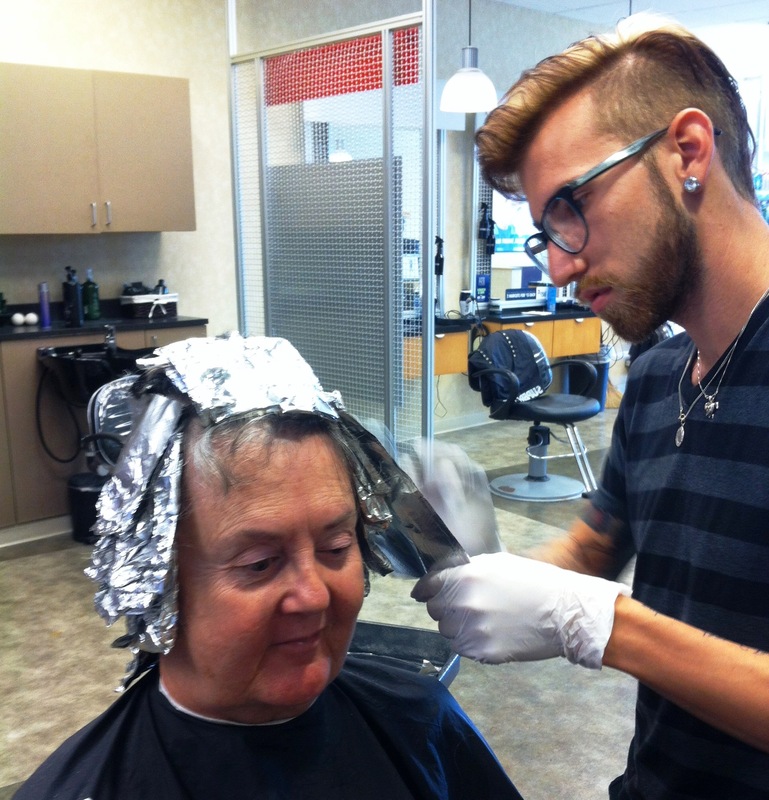 Sitting in Cody’s chair, head full of aluminum foil, I thought, “I could put this on my blog.” That made me begin to wonder: what topics pull my blog together? It certainly is more than just an exploration of the Big Island. It’s more than using the transformation tools that changed my life. My friends tell me “people admire your courage and wish they could have the adventures you create for yourself. 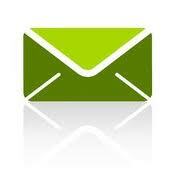 You’re a role model for getting every ounce of juice out of life.” Readers have said the same thing. And when I look at the categories I’ve used to characterize my blog essays, the two that have the most tags are “learning new things” and “getting out of my comfort zone” for adventures like zip-lining, shearing alpacas (okay, I didn’t really shear them but I did help sort the wool), entering and winning a saloon girl contest, lava tube spelunking and dancing the hula on stage. 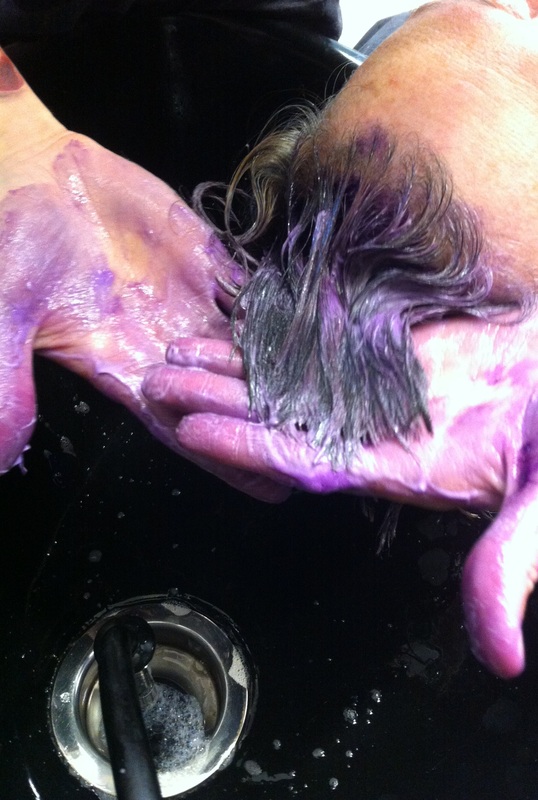 Meanwhile, when I got home with my purple hair, my husband did a classic double take. “What the hell?” What fun! 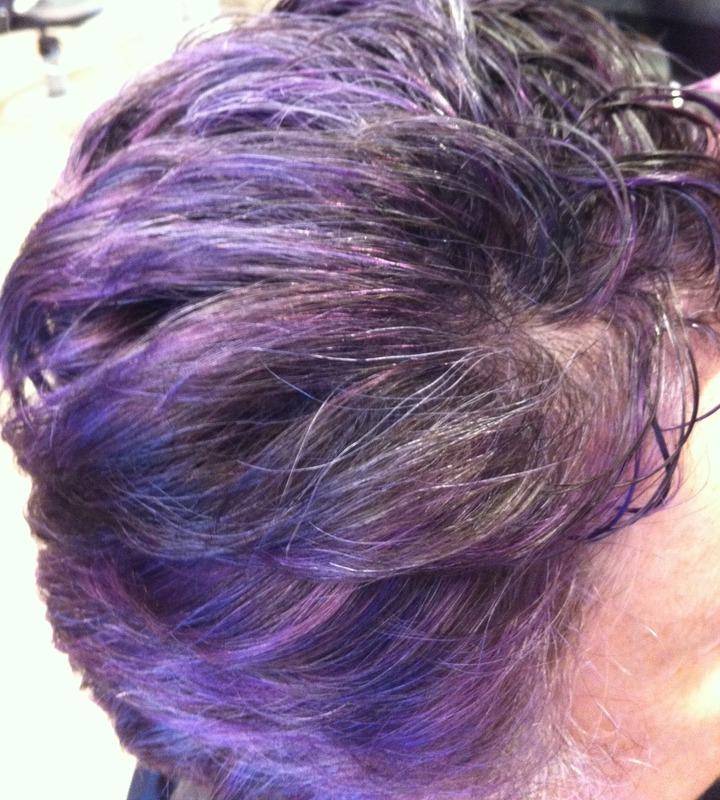 On the downside, until the purple color grows out, I’m going to have to remember to color coordinate what I wear with my hair. 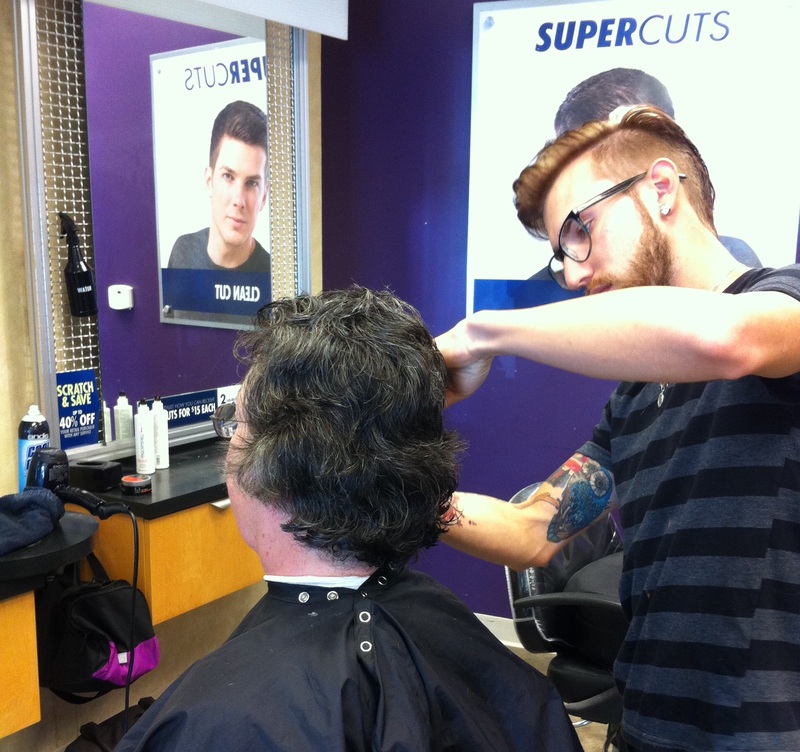 Thank you to Ashia, Kona Commons Supercuts manager, for taking pictures. This entry was posted in getting out of my comfort zone, living full out, Serenity rituals and tagged getting out of my comfort zone, learning new things, living full out, manifesting serenity, Personal transformation tools. Bookmark the permalink. don’t worry, purple goes with EVERYTHING! Thanks Donna. People stop me when I’m shopping to say, “great hair!” and I have to pause a moment before it registers. In Baltimore…you would be considered a RAVENS fan!!! Love it! Thanks Sandy, But No, I’m a Packer Fan. But I won’t dye my hair green and gold. Love it! You will find that strangers treat you differently. At least, that is what I found when I dyed mine bright red last holiday season. Guys were flirting with me in the grocery line and that hadn’t happened in ages. Hope to see it when we head down to Hilo’s beaches. So true about the guys flirting. I hope it lasts that long.